Constable Alan Rosen’s law enforcement knowledge, ethics, business experience, training, and education help him manage and lead the Harris County Precinct 1 Constable’s Office to further success and growth. First elected in 2012 and re-elected in 2016, Constable Rosen has spent more than 27 years in local law enforcement, at the Constable’s Office and the Harris County Sheriff’s Office. He has worked in the Patrol Unit, Marine Patrol Unit, Warrants, Narcotics and Mental Health. Constable Rosen has saved taxpayers’ money every year in office by bringing a business approach to managing the budget. During his first year in office, he created the first Precinct One Special Response Group, the S.W.A.T. – Certified Tactical Response Team and the Game Room and Prostitution Task Force. As a leader in emerging technology, Constable Rosen led Precinct 1 to become the first Harris County law enforcement to deploy body cameras for deputies. He also ensured that all personnel attend required law enforcement ethics training and has the honor of having the first Precinct 1 deputy assigned to the U.S. Drug Enforcement Administration’s Anti-drug Task Force. Constable Rosen has implemented numerous community outreach projects with more than 1000 hours of service. Annually, Constable Rosen hosts a Teen Summit to help bridge the gap between law enforcement and local youth. He is also co-chair of the Harris County Criminal Justice Coordination Council, which is responsible for reforming the Criminal Justice System in Harris County. Under his leadership, the Precinct 1 Constable’s Office was twice awarded the Mothers Against Drunk Driving (MADD) Outstanding Law Enforcement Agency of the Year and was also recognized as the National Night Out Rookie (agency) of the Year. The constable was the recipient of the Acres Home Chamber of Business and Economic Development Inc.’s Empowerment Award in Community Politics for 2014 and the Greater Heights Chamber of Commerce’s Government Advocate of the Year award for 2013. He was awarded the Presidential Volunteerism Award for 2009, 2010 and 2011. He is the recipient of the Chauncy Glover Project’s Heart of Houston Award and the Crime Stoppers Johnny Klevenhagen Award. In November of 2017, Constable Alan Rosen also was chosen as “Elected Official of the Year” by the LGBT community and its F.A.C.E. Awards which honor First Achievers in Community Excellence. He also is the proud recipient of The Latino Learning Center’s Humanitarian Award for 2018. Constable Rosen served or is serving on local civic boards and committees, including the MD Anderson Cancer Center Advance Team board of directors, the Greater Houston Visitors and Convention Bureau board of directors, the Houston Police Department – Citizen Review Committee, the Beth Yeshurun Day School Board of Directors (development chair), Beth Yeshurun Synagogue (security committee) and the Greater Heights Area Chamber of Commerce board of directors. 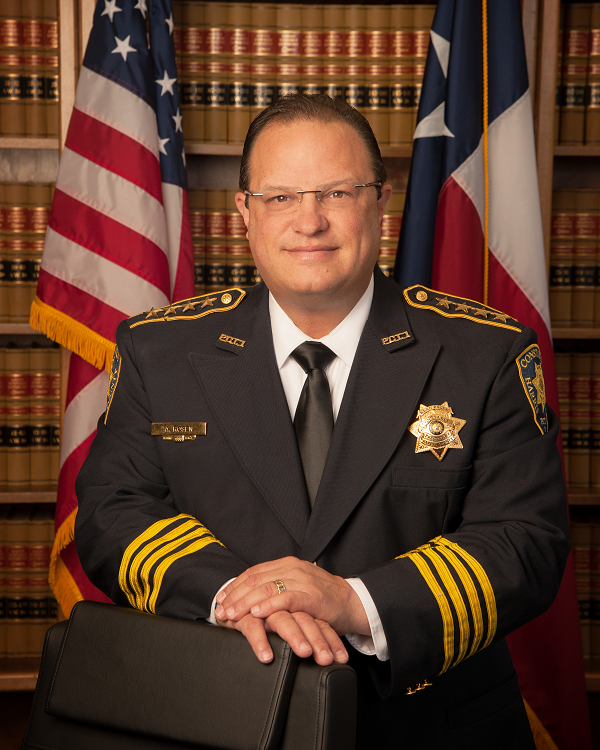 He also serves on the Seven Acres Jewish Geriatric Home board of directors and currently co-chairs the Harris County Law Enforcement Technology Committee. He is a Senior Fellow of the American Leadership Forum, a Life Member of the 100 Club of Houston, and a Life Member of the Houston Livestock Show and Rodeo. Constable Rosen earned a Bachelor of Science degree in Criminal Justice from the University of Houston, graduating with honors. He is deeply committed to keeping families safe, aggressively addressing crime issues and improving the quality of life for all residents of Precinct 1. He and his wife and children are proud residents of the precinct.